DHS provides ELV design and build solution for smart card systems, and we can tailor made the system and provides one-stop solutions for clients easy maintenance. Thee system can integrate with Access Control System, Time Attendance System, Visitor Control System, Lift Control System, Carpark Management System etc. 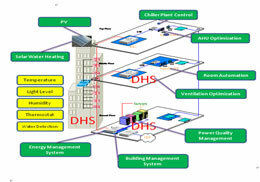 DHS ELV Design and Build Solution also provides security and alarm monitoring design solutions for our clients. We are using Axis communications for network video cameras and video encoders. It increases the sustainability of the systems and the total cost of ownership can be highly reduced in long run.